Hello there everyone! I hope you all had a nice weekend! I know its a bit early for Fourth of July things but ya know what? Its always a good idea to start planning nail art ahead of time right? 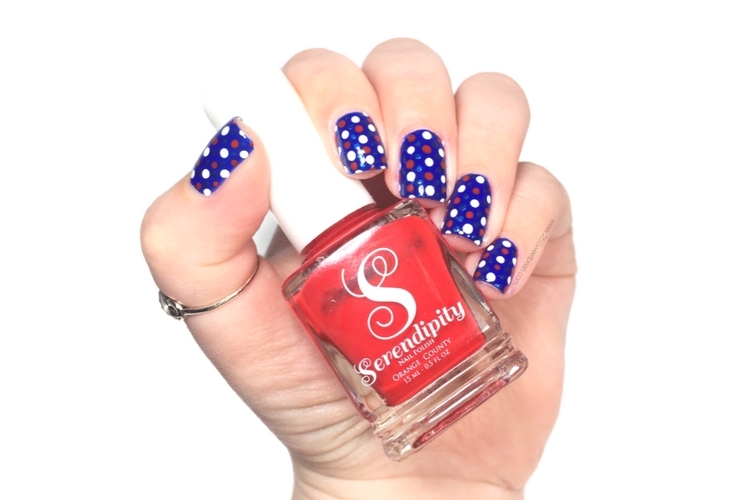 Plus Patriotic things are every where in stores right now so it seemed like a good time to start some manis for you! So first up I have a festive dotticure to share with you! So for this mani I wanted to use one brand, and basic polish colors that most would have. So basically all you need is creme red, white and blue. Then if you have a metallic blue, red, or silver then that would be great too. I used a metallic blue. The polishes are as follows, all of which are Serendipity Nail Polish. I started with my blue base and then went on to the white dots. I only did 3 white dots down the center of each nail then a did another row like that next to it with space and I did them in the opposite. Which I do now realize that does sound a bit confusing but I'm sure by looking at the nail you will get it. Then in between the white going down I did red dots. The red and white dots are the same size. Oh, these are so cute! Perfect festive mani for the fourth! Thank you! Perfect quick mani for the occasion!